A new resource is available for those working with classroom teachers and school leaders. 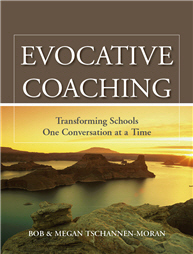 Written by Bob & Megan Tschannen-Moran, Evocative Coaching: Transforming Schools One Conversation at a Time (Jossey-Bass, 2010), incorporates the principles of Appreciative Inquiry into the process of one-on-one coaching for personal and professional development. The Evocative Coaching model works with Story Listening, Expressing Empathy, Appreciative Inquiry, and Design Thinking to move educators beyond old ways of thinking, doing, and being. It inspires and invigorates educators with the passion for making schools better, one conversation at a time. For more information about the book and the coach training program based upon the book, visit www.SchoolTransformation.com. This entry was posted in Publications, Resources and tagged Appreciative Inquiry, Design Thinking, Listening, Schools, Stories, Teachers on August 1, 2010 by Sue. The board meeting, conducted via telephone conference, focused on the activities of participants in expanding the use of strengths-based approaches in the education of children and increasing the practice of Appreciative Inquiry. Two members (Sue James and Robin Stratton-Berkessel) described in glowing terms their experience of the Appreciative Inquiry Conference that was held in Nepal in November of 2009. High points related to location, cultural diversity of attendees and applications of AI in the community, healthcare and spiritual arenas. The group then brainstormed recommendations to make the website more dynamic including brief interviews of board members, stories of interest highlighting education in emergent areas, and stories reflecting the power of children and links to interesting articles. An overview of Voices of Learning in Canton, Ohio. in which 6 schools participated, was presented and overall was a success. The meeting ended with plans to complete the Leap of Learning Manual and enroll interested teachers, school administrators in the training before publication as well as regional offices of education and education boards. This entry was posted in Events, Meetings and tagged Appreciative Inquiry, Children, Education, PCC Board, Schools, Stories, Voices on January 21, 2010 by Sue. In my varied career, including my time as the first UNICEF Regional Advisor for Latin America and the Caribbean, I have worked for the rights of the child in Peru and around the world. Last year I had a wonderful time sharing Peace Ambassadors workshops with women and girls from India, Nepal, and Greece. I just completed three presentations at the International Conference on Human Development that took place in Lima. Now I am preparing to journey to Slovenia and Croatia to work on intercultural issues and coping and resilience in emergency situations. All my work is peace education. The heart of peace education is understanding people’s lives, dreams, cultures, and practices and appreciating them in whatever contributions they make to society. Peace education encompasses flexibility, creativity, discovery, and finding value in every way that collectivity can be built for the common good. Values such as cooperation, trust, solidarity, and respect are essential for peace building. If we want true peace in the world, we shall have to start with the children. We will not have peace in the world if we continue to violate children’s rights. This entry was posted in Articles, Resources, Stories and tagged Children, Education, Hope, Peace, Peru, Stories, UNESCO Manifesto on October 14, 2009 by Sue. Please Send Us Your Stories & News! We invite you to send us your stories about strength focused work with children and youth for publication on the PCC website. Whether you have a short snippet to share or would like to send us a longer story, we’d love to hear from you! Shorter pieces can be published directly on the website. If you would like to send us a longer article, please include a short introduction for publication on the site. We’ll convert the longer piece into a downloadable pdf to accompany the web-page introduction. You may find our PCC Web Writing Guide helpful in writing copy for publication on the web. This entry was posted in Articles, Resources, Stories and tagged Children, Contribute, Stories, Youth on September 10, 2009 by Sue. Our 3-day course for individuals, groups, and group leaders provides opportunity for participants to gain a solid basic understanding of AI, with many opportunities to learn by doing. This workshop is ideal for individuals, leadership groups from organizations, educators, clergy, and anyone who is interested in ‘change at the speed of imagination’! Course facilitators, Marge Schiller PhD. and Joyce Lemke, have worked with a variety of groups from schools to social services, and advocacy groups to business leaders. For three days, they will be at the Duncan Conference Center teaching a dynamic and life-changing course. Note: The Duncan Center has overnight accommodations for 80 people. Semi-private rooms with private bath. Rooms are spacious and quiet with small lounge areas in each building. Each room fitted with twin beds and some queen beds, and has its own library, clock radio, and individual climate controls. This entry was posted in Events, Workshops and tagged Appreciative Inquiry, Schools, Stories on November 25, 2008 by Sue. The Positive Change Core story is the coming together of a group of stories, people and conversations. We invite you to enjoy some of them below. Founder, Dr Marjorie Schiller: It started with a big bang, literally. In NY on September 11, 2001, Dr. Marge Schiller met 3 year old Rachel in NY “I learned that my images of hope are the voices of children“. The experience shifted her from working with executives, corporations and government agencies to children and education communities. “I can think of no more important work…” The story continues to evolve – You can read more of Marjorie’s story here. We invite you to join us, make stories with us, and/or contribute stories of your own, too! This entry was posted in Stories and tagged Appreciative Inquiry, Children, Education, Hope, Stories, Voices, Youth on November 15, 2007 by natalie.